I have heard it said that our planet has a natural satellite, and that there are other bodies that sometimes appear in the sky. But based on my recent experiences that is hearsay and quite unlikely. In fact, Earth, like the mythological Venus, is a completely cloud shrouded world and there is no reason to turn our eyes upward. The ground is the natural area of interest for our people. We say from dust to dust, not space to space. When we are tired our heads drop and point towards the ground, which is where we get sustenance from crops and cattle - food doesn't fall out of the sky. Clouds are placed in the sky to cause us to respectfully turn our gaze down, where it is appropriate to focus our attention and continue to grovel in the dirt. 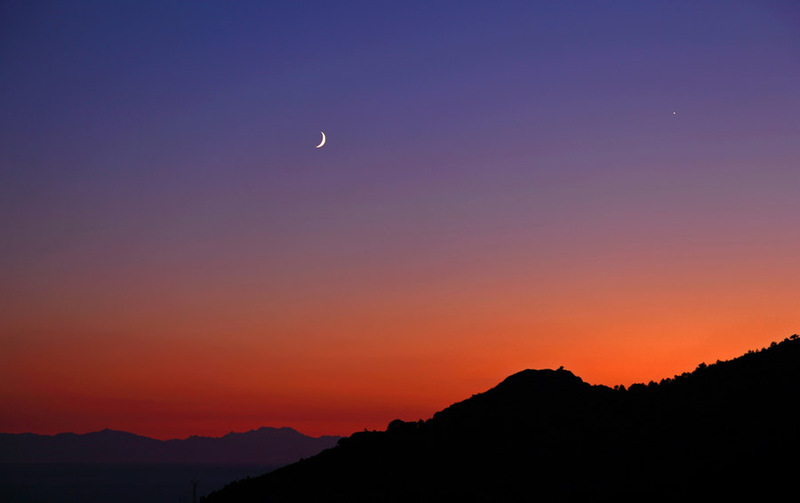 August 10, 2013 showing the crescent Moon and Venus setting in the twilight colors of the sky. This page was last modified on 8 February 2015, at 15:40.